OBJECTIVE: For patients with bilateral pheochromocytomas, adrenalectomy with cortical-sparing technique is a feasible option to reduce the need for lifelong steroid supplementation. The posterior retroperitoneoscopic adrenalectomy (PRA), both cortical-sparing and complete, has been described. Here we report a new technique using a surgical robot in treating this disease. METHODS: A 39yo female patient with multiple endocrine neoplasia 2A with bilateral pheochromocytomas was identified. The patient was positioned, ports were introduced, and the robot was docked as previously described for a left adrenal approach. The tumor was identified and the normal appearing medial adrenal cortex was separated from the mass-containing portion. The remaining adrenal cortex appeared viable after specimen removal. The robot was then repositioned for a right-sided approach and a total adrenalectomy was performed in standard fashion. RESULTS: The patient’s operation was uncomplicated. Surgical time was 3:04 (hours:minutes). Blood loss was negligible. She was admitted to the hospital for 48hrs. Final pathology revealed a 5.1cm left- and a 3.5cm right-sided pheochromocytoma. She had a normal response to a high-dose cosyntropin-stimulation test immediately after surgery and at 6 months post-operatively. CONCLUSIONS/EXPECTATIONS: This case represents the first reported robot-assisted bilateral cortical-sparing PRA with excellent results, demonstrating feasibility of this technique. 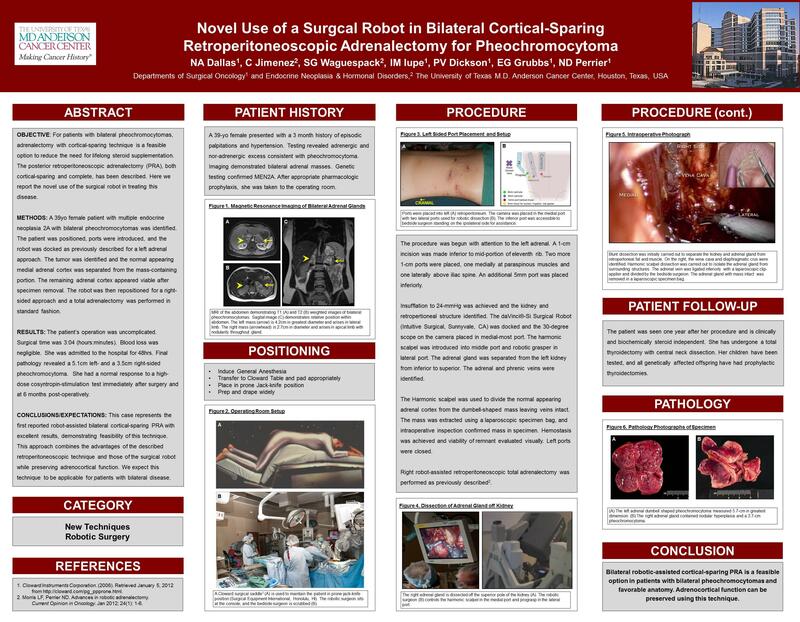 This approach combines the advantages of the described retroperitoneoscopic technique and those of the surgical robot while preserving adrenocortical function. We expect this technique to be applicable for patients with bilateral disease.